Disney cruises, with their roaming characters and casino-free ships, seem like they're just for families. 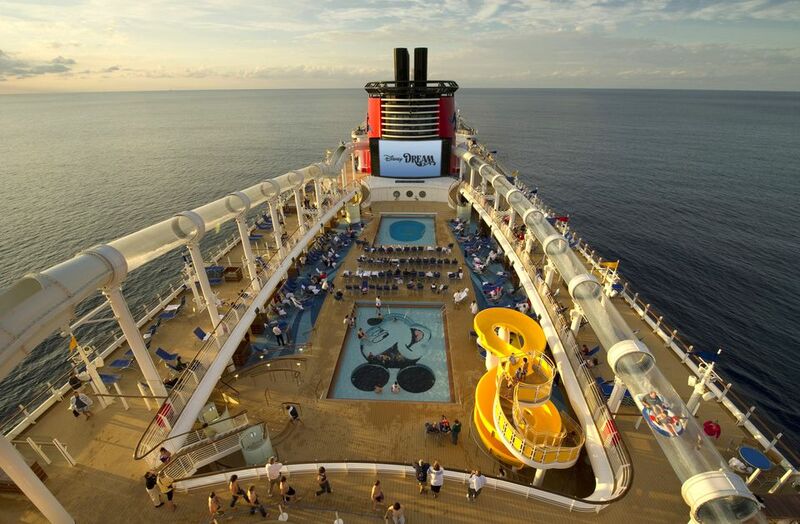 But the immaculate vessels offer plenty for grown-ups to love—even without any little ones high-fiving Mickey. The key? Follow a few strategic tricks to guarantee a relaxing and nearly crowd-free sailing. You might forget kids are onboard at all. Anyone new to the ship should take the "Art of the Theme" tour, offered on most sea days. Although the tour is technically about the ship's artwork, it's also an easy way to orient yourself with the ship at the start of a sailing. You'll learn tidbits both fascinating (Disney lobbied the Coast Guard to paint its lifeboats a new, patented shade of "Mickey Yellow" instead of the regular orange) and useful—the world maps in the hallway carpets face forward, so you won't get turned around on the nearly identical floors. Watching the sea go by from a private balcony is a luxury well worth splashing out on—the water is mesmerizing, and having outdoor space away from the masses is invaluable. You won’t be price-gouged for the privilege, either. On many Disney Caribbean and Bahamas sailings, verandah rooms, with enough space for two to sit comfortably outside, cost $150 to $200 more than inside staterooms (for the entire trip). The downside: You won’t get to check out Disney’s innovative Magical Portholes, digital "windows" in interior staterooms that display real-time video of the sea (with occasional visits from favorite characters, including Dumbo and the main mouse himself—or even a Millennium Falcon flyby on Star Wars Day at Sea). Disney is one of the few major cruise lines to allow passengers to carry on their own alcohol. Although you can only pack drinks into your carry-on (baggage handlers rough around checked luggage, leading to easy breaks and spills), the policy leads to some serious savings—particularly if you plan to dine at Palo or Remy, two fine-dining restaurants onboard. Some conditions apply: Each guest may bring up to two bottles of unopened wine or champagne and six beers at the beginning of the trip and at each port of call. Expect a $25 corkage fee in all dining rooms. On the first day at sea, the line for booking port adventures can snake down the hallway. Avoid the peer pressure to book immediately, and wait until the second day. Most excursions are still available, and the line is often empty. If you’re worried about an excursion selling out, chat up a bartender and get a professional opinion; many have sailed long enough to know crowd patterns and preferences. The adults-only Senses Spa offers plenty of massages and facials, and on port days they’re discounted up to $40 (specials vary by sailing). Don’t want to skip a sunny day at port? Book a treatment for the hour or so before you have to be back on the boat. Nearly every Caribbean sailing stops at Castaway Cay, Disney’s private island in the Bahamas. Snagging beach space is sometimes competitive, so sign up for the Castaway Cay 5K. The (untimed) fun run loops around the small isle, helping you get your bearings for the day, but the real bonus is timing: You’ll exit the ship the moment it docks. Pack a beach bag and stash it on a lounge chair before jogging off those piña coladas. In the rare case that bad weather cancels the port day—high winds can make maneuvering into the island’s dock impossible—the race will still run…in circles around the ship’s track. Everything’s a story, right? All Disney cruise ships offer at least one adults-only, fine-dining restaurant (for a surcharge), while the newer Disney Fantasy and Disney Dream offer two choices: Palo, a Northern Italian restaurant ($30 surcharge) and Remy, a white tablecloth French experience ($85 surcharge). Both are well worth the extra cash, with meals that rival similar big-city eateries. At Palo, order any fresh pasta (typically gnocchi and one special); ask for a half-portion if you want to taste several. At Remy (themed after Ratatouille), check out the wines on display—one is a bottle of Chateau Cheval Blanc 1947 that intimidating food critic Anton Ego drank in the movie. It’s yours for a cool $25,000. Make reservations as many as 75 days out; prime time dinner slots fill up before boarding day. Explore the Ship at 5:30 p.m. The golden hours on a Disney cruise are 5:30 to 8 p.m. The first dinner seating—preferred by many families with young kids—begins at 6:45 p.m. That means the main deck starts clearing out around 5:30 p.m., making it easy to explore parts of the ship that are crowded or have long lines throughout the day. On the Disney Fantasy, the AquaDuck—a sweet “water coaster” that borders the entire ship—has no lines at sunset. Take advantage and snag a few rides in a row, then warm up and watch the sun go down in the adults-only hot tub.